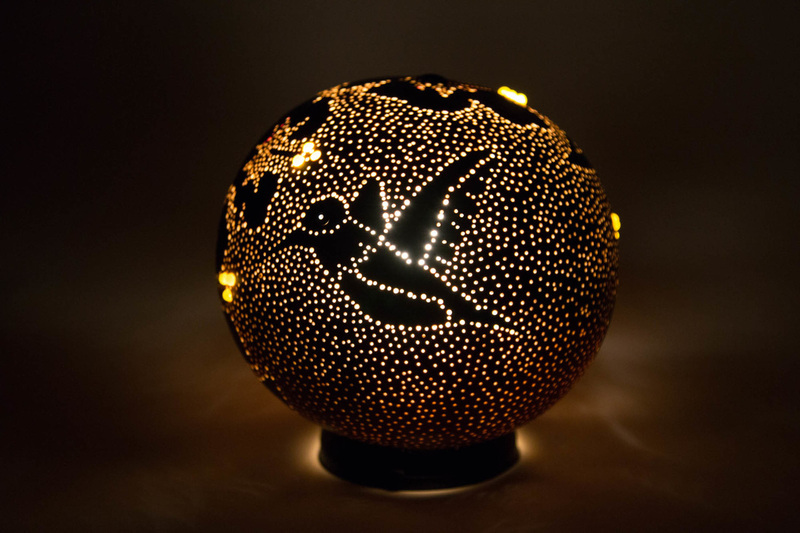 Hi, my name is Juley and I make lamps out of gourds! I've always been drawn to the creative side of things. I knew nothing about gourd art until I met a gourd artist through my son's documentary film work. The instant I saw her work, I knew I had to give it a try. I was hooked the second I made my first saw cut. Ideas for gourd art began to flow and I still come up with new ones every day! This genre pulls all my interests together. I get to design, draw, paint and use small power tools to create beautiful art. I try to create lamps which enhance the atmosphere of any room you put them in. My lamps appear as different works of art depending on the time of day. During the daylight hours, the shape and natural markings of the gourd are an interesting sculpture by itself. But if I etch or paint a design on the gourd, then it becomes a piece of art. At night, the light warmly glows through the design and gives a warm cozy feeling to the room. You will notice many of my gourd designs feature birds. I love to feed and watch birds. I find the relationship between birds and humans to be fascinating. Most of the birds at my feeder trust me enough at this point to continue feeding while I am filling the feeder! I put all this watching to good use by counting the birds at my feeder for Cornell University. Feederwatch is a citizen science program that collects data on birds from people all over the globe. It has helped scientists determine what is changing in the bird world and which bird species are thriving and which may need our help. I live in the shopping mecca of Freeport, Maine and am the mother of two college-aged sons. I have been asked by friends if there is anything I can't do? I have a wide range of interests and skills. I love to use power tools to build things, decorated beautiful wedding cakes, tiled bathrooms, painted houses, painted greeting cards and taught elementary aged children how to read and write.